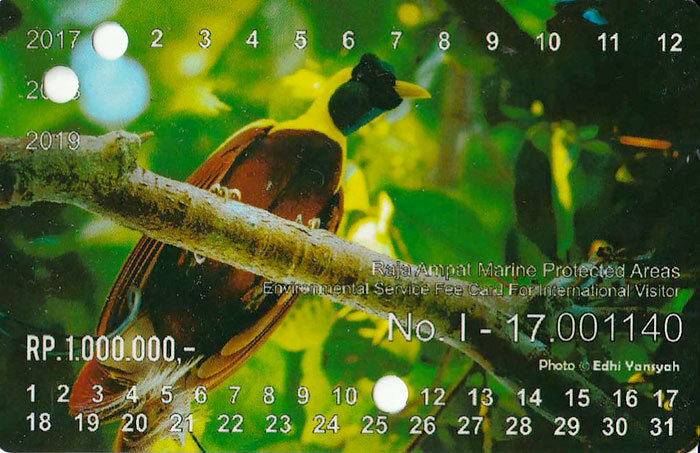 Raja Ampat Marine Park entry permit. Why it's necessary & where to get it. Children under 12 years of age are not required to have a permit. The permit is valid for 12 months from date of purchase. Jump to where to purchase. Jump to where the money goes. This is what the 2017 international visitor permit card looks like. (There are a few different images used.) The 85x55mm plastic card will be punched to indicate its expiry (12 months from the date of issue) and your name, passport number, nationality and signature should be recorded on the back. Where does the Raja Ampat entry fee money go? Raja Ampat Marine Park entry permit fees are directed to the operational costs of Raja Ampat’s five Marine Protected Areas (patrols, administration etc) and to community conservation and development programs. Collection of the funds is the responsibility of a new organisation created to ensure the transparent disbursement of funds: The UPTD BLUD, an autonomous unit within the Dinas Kelautan dan Perikanan (the local government Department of Oceans and Fisheries). 1) The organisation previously responsible for collection of the Marine Park fee was the Dinas Pariwisata – the local government Department of Tourism. The corporate structure of the Dinas Pariwisata provided no framework by which it could legally transfer funds collected to the intended recipients. The new UPTD, being incorporated as a BLUD entity, does. 2) The fees have been doubled in order to provide an income stream that will account for a larger percentage of the true Marine Protected Area operational costs and community development programs. Those costs are currently being funded by foreign donors – a situation which obviously isn’t sustainable in the long term. The Raja Ampat Marine Park Entry Permit tag (or PIN) has been renamed the Tariff to Support Environmental Services in Raja Ampat and must be paid by every visitor to Raja Ampat. 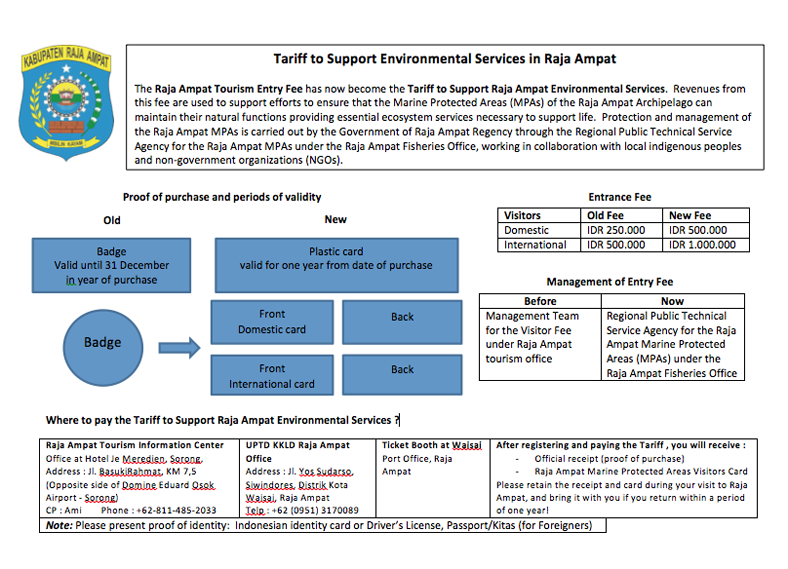 The information below explains the changes, why the Tariff to Support Environmental Services in Raja Ampat is charged and shows how the funds collected are used. Click the images to see larger versions. Permits are currently being sold at the KKPD desk, next to the Raja Ampat Homestay Information Center in the port at Waisai. Both of these offices are currently in the temporary location shown in the gallery below. You must pay in Indoesian Rupiah or with a credit card. NOTE: Permits are sometimes sold instead at a KKPD counter inside the big white and blue port building. If your ferry docks on that side of the harbour, it would probably be worth checking there first. You may be approached on arrival by men checking to see if you already have a permit. They’ll guide you to the office if not. Don’t pay anywhere except at the office counter. Waisai port building, where permits are are also sometimes sold. If you are flying in to Waisai’s Marinda Airport, we’ve been told that you can also purchase the permits there. The UPTD Office address is Jalan Yosudarso, Siwindores, Waisai. Any ojek (motorbike taxi) or vehicle driver should be able to take you there from the harbour. The UPTD office is also the place to go to report any instances of environmental damage or illegal fishing that you may witness. Permits are sold by park rangers in Misool. The rangers carry identification and will give you a receipt. Is it safe to buy the tickets for the ferry between Sorong and Waisai at the port in Sorong on the day of departure ? As far as we know Ramon, that’s the only way you can buy them. See this info. I travelled to Raja Ampat in Dec 2018 and have paid the marine park fee which is valid till one year. I am travelling next month to Ambon (Banda Sea) and would be doing a liveaboard trip. Is the marine park fee valid for that area as well? 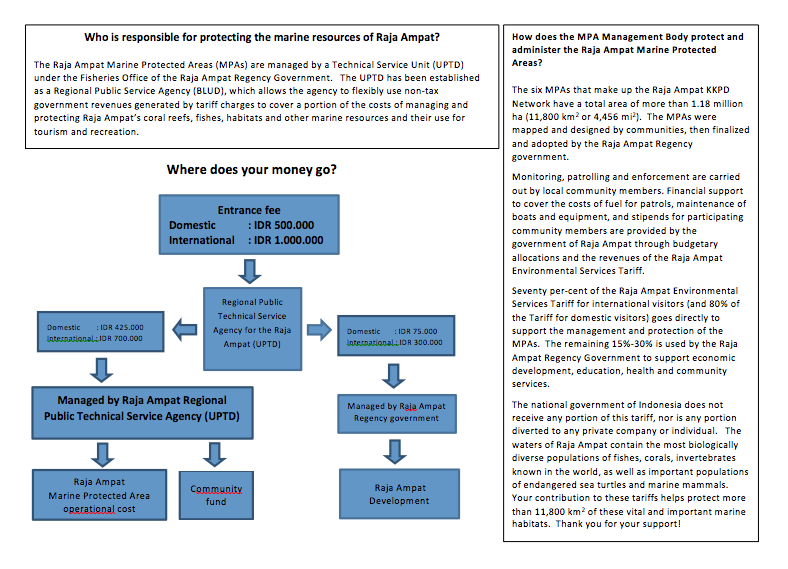 What is the area that the raja ampat marine park fee covers? 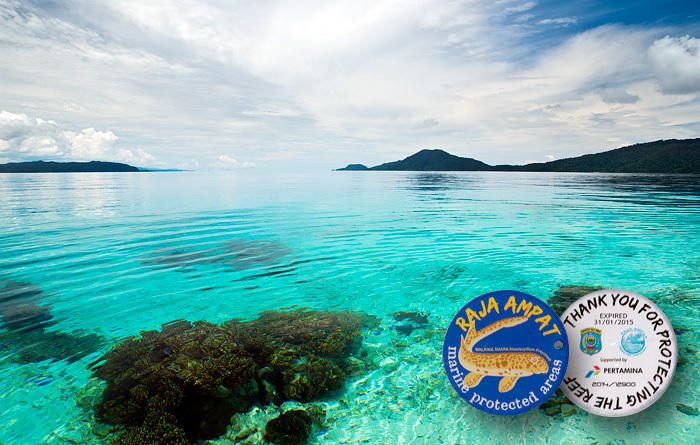 The permit is only valid for entry to Raja Ampat, Nam. It does not apply anywhere outside Raja Ampat regency. thank you for this website, it’s very useful. We arrive at next Friday, 8th February in Sorong and wanted to take the Public boat to Arefi where we arranged our pick up and booked Yenaduak Homestay. I just read that you cannot buy the permit in Sorong. Is it still the most actual information? Do we have to change all our travel plans and bookings now? We really appreciate a fast answer, because we are very unsure what to do now and time is short for us…. 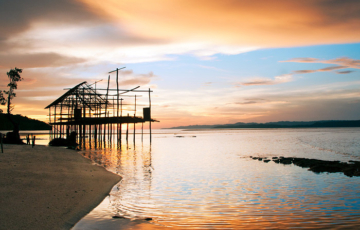 To the best of our knowledge, it is still not possible to buy permits in Sorong. You don’t need to change anything. If you do not visit Waisai, then you can not be expected to purchase a permit. If you happen to see a MPA patrol vessel, then perhaps you will be able to buy one from them. I’d like to know if the rays Mantas arrived in Raja Anpat. Dampier Strait manta season is usually from mid-October to mid-May, and yes – they are present now. Just an update that, on 3 Nov 2018 when we were at the port, the temporary building to pay for the tag (and register for your Homestay) now has the single sign “tourist information” rather than the two separate signs for Homestay Association and KKPD. So if you see “tourist information,” don’t worry – you’re in the right place! Hello, we are going directly from Sorong to Batanta, than to the another islands, so where we should buy the permit card? Thank you for answer. As above, and to the best of our knowledge, the only place that the permit can be purchased right now is at Waisai port. If you will not be passing through Waisai at any stage, then you simply won’t be able to get one! Hi Kamila, are you taking the public boat from Sorong to Batanta? As above, children under 12 do not need a permit, so yes – children aged 12 and above do need one. Is the Raja Ampat Marine Park entry permit also valid to dive in the Cenderawasih Bay ( Nabire) ? Cenderawasih Bay isn’t part of Raja Ampat and we’ve never heard of any fee being required to visit there, but we can’t say for sure. Hi Myriam, we were in Cenderawasih Bay after we visited Raja Ampat last spring. To my knowledge there are no fees in Cenderawasih Bay. Is it possible pay by card at Waisai Port? It was last time we were there Nicole. Now, as we humans are, we will destroy even the last paradies on earth such as Raja Ampat. With more and more tourist comming in to Raja Apmat also more and more trash will be stranding there and as I have seen my self there is no recycling anywhere. The ocean will do it..NOT! Why is the goverment not doing something about it? Because of course, you dont make any money of it..Now they plan to make a second Bali out of Raja Ampat, that would be the end with the incredible wild life and also with the local people.. Thank you for the good homepage. 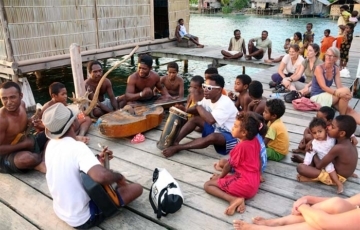 We will be staying at a homestay on Batanta and will be picked up by our host in Sorong. Where can we buy the Raja Ampat Marine Park entry fee, since we won’t be in Waisai? To the best of our knowledge, the permits aren’t currently available anywhere except in Waisai, so if you won’t be passing through there at any stage, then there’s not really any way you can get one! Hello. I’m trying to find out if a surat jalan is required to visit Timika, but I can’t find anything online suggesting that it is currently needed. We will be travelling by air from Bali. Any idea if a permit is needed, or where we could get one? Thanks for your help. We believe a SJ is required for Timika. To get one you need to register at a police station in the region you’ll be visiting. Could you please give us the latest price of Park permit fee for 2018? Some resort are chargin up to 1,250,000 IDR and that does not seem right. That’s not right at all. The permit costs 1 million for foreign visitors. They are obviously charging a “service fee” or “commission”. If you pay them to buy you one, make sure you receive a genuine permit card. As I will not be going to Wasai, do you know if I can buy it at the airport of Sorong? Last time we were in Sorong, you couldn’t get one there at all. We believe it’s to do with the fact that Sorong is not part of the Raja Ampat regency, but then – how are people heading for Misool supposed to buy one? Perhaps there’s a place in Misool? It is a terrible horror, a lack of law and regulations in your region, and over all a sample of ignorance of the people in Sorong with the killing of crocodiles. It is outrageous and despictable what happened there. Sorong is not part of Raja Ampat, Joaquin, but we agree – it’s a terrible horror indeed, as must have been the death of the man that sparked the slaughter. Crocodiles are protected under Indonesian law, which begs the question: For what purpose and with what permits did that “farm” exist? We visited it 4 years ago, and to call it a “farm” is very generous indeed. It was more like a crocodile prison, and there was no sign then of it being any kind of viable business. We would be very surprised if the Papuan communities it was established among were the owners or benefited from its existence in any way. If that is the case, then perhaps that goes some way toward explaining the community’s extreme reaction when one of their own was killed by the animals there. Whatever the case, it is despicable that those poor animals were treated the way they were, and it’s certain that there’s a lot more to the story than the sensational headlines and video clip convey. Hi, we are planning to get picked up in Sorong to go straight to Batanta. We will leave 18 days later from Waisai by plane. Yes – that shouldn’t be a problem. We arrived by plane at Waisai and it was impossible to find a place to pay the permit. Nobody asked us for the permit and we went to our homestay without it. After ten days we took the ferry back to Sorong and inside the ship a rude guy from Raja Ampat community (or something like that) made pressure to get the money. I think that Raja Ampat should take care of all the visitors (ferry or plane) and provide a easy way to pay the fee. Anyway, another places in Indonesia (like Togean, Banda, Mentawai…) have the same enviroments problems and they are free of charge. It is not a good idea demand 100 dollars (plus expensive boat trips, homestays, diving…) to enjoy these paradise islands. It is not cheap to arrive at Raja Ampat and the incredible cost of the permit is an abuse for the independent travellers. Maybe Raja Ampat only want high class tourist (and then why the existence of homestays?). I read carefully all about the entry permit but I think that the exaggerated cost is negative for the local communities and it dont help to promote the devolpment of the area. it is only my personal opinion. Hi a friend of mine recently visited Raja Ampat and I was wondering if I could enter the park with his PIN? There is no name or passport number on the bag of the tag. Not sure if we’re understanding you correctly, but the permit is as described above: It’s a punched card with a picture on it, with the back containing some text and fields in which a name and passport number is recorded. If what you have is a tag, not a card with those features, then it is not the permit you need. We have never seen a proper permit card that has been issued blank and don’t know what any inspector might make of that if that’s indeed what you have. Do we need to pay cash for the entry permit or can we use a credit card? The last time we visited you needed to pay with cash. This may have changed by now, but be aware of this info about using credit cards in Indonesia. How can we buy a permit if we are a visiting yacht (international) , cleared, with visa for indonesia, and it is not possible to go to waisai because it is out of your itinerary? Can we buy it online? Or make a bank transfer and then it gets mailed to us in Australia? So it is sorted before departure? Thanks you in advance for your answer! To the best of our knowledge, the permits are currently only available in Waisai as described above. There is no way to purchase them online. If you’re part of an organised trip of some kind, then it would be up to your local service provider to organise them for you. We don’t know how independent travellers headed to Misool are supposed to buy them! Hi, we are not on an organized trip, we are on a independent sail yacht. Going to Waisai is against wind, and tides and can’t be done. We are willing to pay the fees and support the local economy as much as we can. It’s sad we can’t do it and if we still go there (which we might without permit), we run the risk to have disputes with locals over it . This might deter a lot of international yachts to visit. Please let us know when the fees can be paid online. If the responsible authorities ever decide to make the permits available online, we’ll definitely let everyone know. Both here on the website and via our social media channels. Does the ferry from Sorong to Waisai run on Sundays, I was told they don’t. If so what times. Yes it does Narelle. Timetables are here. We were to sail from Ambon to Banda into the Raja Ampat from the 24th November to 6th December 2017, however we sailed up to Misool and unfortunately our live aboard MY Sea Horse of Indo Cruises had mechanical failure and we had to cut short our trip and we missed out on diving in the Raja Ampat completely. Can our valid Raja Ampat marine park fee permit that expires on the 6th December 2018 be extended for a few more days in December 2018 itself. Looking forward to hearing from you..
Our understanding is that you would have to buy new permits. You would need to contact the UTPD KKPD office (details above) to ask if extensions are possible. Thank you for messaging back … we have tried calling the numbers mentioned above i.e +62951328358 as well as +629513170089 but there has been no reply . We have also sent an email to info.blud.uptdr4@gmail.com , but once again no reply. The only other way that we know of that you could try is via the KKPD website. Slightly different topic, but I heard that soon all liveaboard boats will need to be moored near Waisai and visit the dive sites in this area by using smaller boat only. Does anyone know if this is confirmed and where I could find more information? Thanks everyone! We can’t confirm if that’s true or not Carolyn, but the idea has been floating around for a few years now. Perhaps the recent damage done to the reef on Kri’s southern coast by a liveaboard which dragged its anchor during a storm and was blown ashore there has triggered some action? Moorings should have been made mandatory years ago: The unseen damage done to reefs every year by liveaboard anchors is far in excess of that done by the highly publicised Caledonian Sky incident. If this latest rumour is true, the Indonesian Liveaboard Association should surely know? Thank you so much for the information. I agree, moorings are much better for the reef than all this random anchor dropping. I’ll follow up with the link you sent. Cheers! Great article.. all I need to find out what PIN is. Was at Misool RA lastweek and lucky me, I don’t have to purchase PIN because we went to the islands with elders from Fafanlap and Foley village who claimed as the owner of some Islands and places at RA. Yes sounds funny that they said they own the nature, but this is what happen at Raja Ampat. We are Kitas holders visiting RA in january. Your article content above states International Guests Rp1m and Residents Rp500k for the Marine Park Entry permit. The tariff document above states International and Domestic, the latter of which would normally include Kitas holders though these are not the same status a Resident. Can you please confirm which fee applies to Kitas holders. Our experience has been that only Indonesian citizens qualify for the domestic price. Holding a KITAS did not qualify. Germany Lady, name Annette not buy permit. stay mambetron and delvin homestay. she make tour Arbrek, Manta sandy and other places. why she not pay like everyone else? why she not get fine and thrown out of Raja Ampat? we not need people like this. Hello! I am not sure if i understand this right, so this permit is for the entry means once or daily? “The permit is valid for 12 months from date of purchase” means that you pay once and can enter as many times as you like for the next 12 months. Hello! I will fly into raja ampat from sorong on the 25th december, I’ll arrive in sorong at 7.30 and then I’ll fly to marinda raja ampat airport at 13:45. Since it is Christmas day, I think every office will be closed, how can I get the entrance permit? As far as we know, the Waisai office is open every day. FYI only, I’m an Indonesian resident with kitap and I paid IDR 500k only, my two children, age 12 and 13 who are holding Indonesian passports did not pay any entrance fee. You can easily purchase your entrance ticket at Waisai after arriving with the ferry. I arrive on Sunday – out of all days and will be taking a ferry over to Raja Ampat. Where will be the place place to purchase a permit pass for Raja Ampat? Waisai is the most convenient Jamie. We are coming to Raja Ampat in the end off november. Our flight from Makassar arrives in Sorong at 07.30. I read about the ferries and saw that many times they leave later. Do you think that it’s possible to take the Ferry to Waisai at 0900 or do we have to wait until 1400? And where is the best way to buy our entry permit? You should have no problem making the 0900 ferry if your flight lands on time. Best place to buy the entry permit would be at the Waisai port office as described above. I heard it: there is no ferry at 9 am, only start 14pm. The ferry timetables published on this page were correct a few weeks ago. Perhaps a 0900 one was cancelled on one day? Anything’s possible! We were in Raja Ampat in March 2017 and wanted to pay the fee but were not able to both when arriving and leaving. We arrived on Sunday and the office in Sorong was closed and nobody in Waisai either to pay. We thought we could pay it before leaving but as we got to Waisai for the 9am ferry to Sorong, nobody was there accepting the fee. People said there were supposed to be officials at a desk across the ferry ticket counter but they were not around. Were there many others like us? If the government is serious about this, why not making it easy for people to pay instead of just placing info banners every where? Since most people use ferry to reach Raja Ampat, one solution can be to partner with the ferry company so they can be a collecting agent. You’re not alone Gaby – this happens all too frequently. It seems to us that the obvious solution is to make the permits available for sale at homestays. The Homestay Association is working toward making this happen, but it remains to be seen whether the UPTD/KKPD will be amenable to that idea. If all else fails, the Homestay Association is planning to buy the permits for their guests and have them ready when meeting guests in Waisai. That would mean guests would need to pay for them via the website prior to arrival. We’ll see what happens! Hope things will work out fine that the next time we go, we can pay. Hi,is there any way to buy the Permit at the Airport of waisai? Not yet Walter. Only at the port or UPTD office as described above. UPDATE: Good news! Thanks to Pim, we now know that you can indeed buy permits at the airport! We will be going to Raja Ampat in a few weeks and would like to know about payments. Do we need all IDR or can we buy certain things (like PIN, homestays,…) with euro’s or credit card? Please see our step by step guide for links to the answers to all these types of questions. At most homestays you have to pay in cash in IDR. A few homestays accept credit card payments. (Be sure to read this before relying on credit cards.) You can find homestays with credit card facilities using the Advanced search on the accommodation page. My husband and I will be travelling to Sorong from Jakarta and then on to Wasai. Due to our flight times, we do not require a night in Sorong. However, we will be arriving on a Saturday morning from Jakarta and intend on getting the 12pm ferry to Wasai. How would you suggest that we purchase our entry permits? As above Jessica. Either from the Sorong office opposite the airport access road, or from the Waisai port office. Most people find the Waisai option more convenient because the Sorong office doesn’t open until about 10am. hello, we are currently in indonesia and are thinking of coming to Raja Ampat next month…as we have already cleared into the country would it be easier to get our marine park entry tag at Waisai instead of Sorong? another query i have is that we are sailing with a small dog…are dogs allowed into the marine park even if they stay onboard? Yes – definitely easier to get the permits at Waisai. I think your dog should be fine: There’s nothing about pets in the rules and there are plenty of dogs on the inhabited islands in the MPAs! Whats the distance between where the ferry arrives in Wasai and the office where you buy the Raja Ampat permit ? I will be travelling alone and have a lot of gear on me. Also, is there a mini-mart type of place at Wasai or Sorong ports where you can buy supplies (snacks, drinks, etc) ? It’s maybe 200m from the usual ferry wharf to the building pictured above. If you have booked using the website booking form and requested a pickup, your hosts will meet you at the ferry. They would be able to take care of your gear while you buy the permit. There’s no mini-mart, but there are small stalls inside the port building that sell drinks and snacks. Not that we’ve seen Chris. As mentioned above though: You don’t have to get them in Sorong – there’s an office at the port in Waisai that sells them. Can you please let us know if the ferry schedule on this site is updated i.e. that there is morning ferries on Monday, Wednesday and Fridays only? We are arriving in Sorong on a Sunday morning around 6 am and wonder if there is a morning ferry on Sundays. The ferry schedule is as published here. It was correct when we last visited in September 2016 and to the best of our knowledge has not changed since then. Hi! Is it possible to pay the PIN in dollars? Thanks! It’s supposed to be paid in IDR, but you might be able to pay in dollars. Although if it did prove possible, you would almost certainly get a terrible exchange rate. In case you haven’t seen it already, the latest Sorong-Misool ferry timetable that that we know of is published on the Misool homestay pages. What about permit fee for international visitors with KITAS. According to the regulation of indonesian government , the cost for international visitors with KITAS to purchase ticket in Indonesia should refer to that of Indonesian citizens. The regulation establishing the permit fees says that only Indonesian citizens can purchase the permit for IDR 500,000 – it does not provide the same for KITAS holders. We have been told that KITAS holders must pay IDR 1,000,000. Having travelled extensively throughout Indonesia from west to east for the past 10 years, I feel that the 1,000,000 IDR for international visitors to visit Raja Ampat is not justified and a con. Nobody knows where the money goes. I assure you It is likely to go into the pockets of corrupt individuals. Indo people have a perception that all westerners are rich so they can charge them what they like. This is not true as not all westerners are rich especially in Europe. Tnsportation costs in Raja Ampat are astronomical too and are clearly not justified either. I can assure you that there are many homestay owners in Raja Ampat who are a lot richer then some of us westerners. Yes, Raja Ampat is beautiful but so are other places in Indonesia which are just as beautiful and much cheaper. You’re not alone in that assessment, but it’s an inaccurate one. Both the amount of the fee and its disbursement as described above were set in close consultation with Conservation International and CI continues to provide support and have staff working with the UPTD BLUD. Where the money goes is transparently documented. The permit price has been deliberately set precisely to discourage the development of a mass tourism industry in Raja Ampat. This is an approach successfully employed in places like Bhutan to protect environments susceptible to damage from high tourist numbers. Transport costs in Raja Ampat are definitely more expensive than they need to be, but have fallen substantially over the last six years and will continue to do so until they reach the appropriate market level. To expect transport in Raja Ampat to ever be as cheap as elsewhere in Indonesia is unrealistic though, as the base fuel price in Raja Ampat is twice what it is in the rest of the country. In the end, it’s up to the individual. If you think it’s worth it, go. If you don’t, then – as you so rightly point out – there are plenty of other, cheaper alternatives. We are travelling to Raja Ampat next week and I was wondering whether it is possible to purchase the PIN in advance, so we only need to collect it at the office? Yes – as mentioned above, you can contact the office to arrange prepayment by bank transfer. Do you by any chance know the BIC/SWIFT code of the bank account they use, and the address of the recipient? Sorry Feike – we don’t. You need to contact them by one of the methods provided above if you want to pay in advance. Do we need an additional permit to travel in West Papua? Thanks for all good tips here! 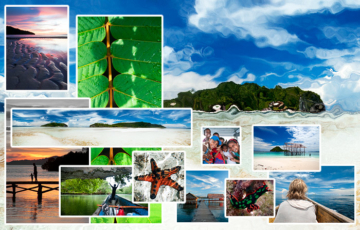 We’re planning to travel to Raja Ampat in September 2016. Can we book the ferry from Sorong to Raja Ampar islands online in advance ? You can’t, but you won’t have any problem getting one on arrival. Will be comming to Raja Ampat this week, was wondering for the required documents we need to get the permit? We will travel directly from Jakarta to Sorong so can’t really make any copies of the visum as we would only get this in Jakarta airport, is it possible to get copies made when paying for the permit? Hi Marcus – you don’t need any documents to be able to purchase the Entry Permit. You just need to show your passport and pay the fee. I will be sailing from bira to sorong and dive in misool before disermbark in sorong port. How can I buy the pin ? Quel sont les démarges pour obtenir le permis pour avoir accès aux parc marins et quel est son prix et depuis Sorong ? We have no French, so forgive us for answering in English. 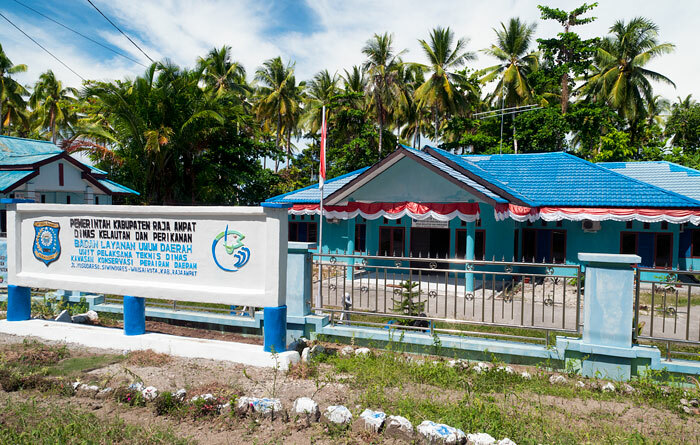 You pay IDR 1,000,000 per person for a permit and you buy them in Sorong or Waisai at one of the 3 offices described and pictured above. I am an Indonesian Citizen but will be travelling to Indonesia on my Australian passport (dual citizen). Can I still get the entry permit tag at the IDR500,000 price and will I have to bring my Indonesian passport to the ticket office with me? You need to show proof of Indonesian citizenship to get the lower rate, so you’ll need to take your Indonesian passport or KTP. I was in raja ampat in August 2015. Is my marine tag valid until August 2016? The dive resort i am booking with for february 2016 claims that tags are valid for one year from 31 january to 31 january and therefore mine is no longer valid? From Feb 1 2015, all permits are valid for one year from date of purchase, so the only way that what the resort is telling you could be true is if they sold you an old permit instead of one of the new ones. You should have been given your permit. The new ones are in the form of a card, the old ones were a plastic disc. Both clearly show the expiry date. is there any hostel near the airport of Sorong? The nearest accommodation to the airport is the JE Meridien hotel. It is opposite the airport exit, a few hundred metres to the right. See their website for prices. Hi! Is it true that the 9am ferry today got cancelled? We’re not based in Raja Ampat Olivia, so we can’t say. We do know that the 2pm one on Mon Nov 30 had its Sorong departure delayed by 4 hours to due an overloading issue. Delays occasionally happen, but we’ve never heard of a cancellation before. Anything’s possible though. Hi! I will be visiting Raja Ampat in a couple of months. I understand that I have to pay the entry permit fee of 100 USD. My guide tells me that I have to pay a 100 USD harbour fee as well. Can you tell me what is this harbour fee for? Thanks! All harbours charge fees to vessels using their facilities to cover their operating costs. It’s much like paying to use a carpark. Harbour fees are usually charged per vessel though, not per passenger. We have no idea what the Sorong harbour fees are, or how many people are on your boat, so can’t say if the USD100 you’re being asked for is a reasonable amount or not. We will be visiting R4 in December. We fly into Sorong, landing at 12:25pm. We had planned on taking the 2pm ferry and getting our Marine Park Entry Tag in Waisai at the Port Office. However, this page says the ferry leaves Sorong at 2pm (if on time) and takes 2 hours to cross. It also says the Port Office closes at 4pm. Would we be better to get our permits at JE in Sorong? Hi, we have plan a cruise ship will visit Raja Ampat next month, passengers will pay for the entry permit, what about the crew member? Are they must pay the entry permit too? Sorry, but we don’t know. We don’t think crew would have to pay. Suggest you ask cruise company! Do the children have to pay a marine park entry permit tag? I would like to know about the last updates regarding the permit. I am spending a lot of time in Indonesia and I would like to know if the permit is really valid from the day of purchase until the end of the calendar year? Or is now for a 12 months period? I read all the messages on the forum and it seems that nothing was entirely definite up until recently (cf June messages). Basically, I would like to know if I can purchase my permit now to go there very soon. And then come back with friends in a few months without purchasing a new one. And possibly regularly. The information at the top of this page is correct: The permit is valid for 12 months from date of purchase. You can’t buy one anywhere except in the offices at Sorong and Waisai. NOTE: The Sorong office has moved from the JE Meridien Hotel to a shop of its own directly opposite the airport exit. We’ll soon be adding that updated information to this page. Hi, I have a permit that I bought on February 16 2015, and am coming back in February 2016, arriving on the 20th. Will I need to buy a new permit or is it valid for the full month of February? That permit will expire on Feb 16, 2016 so you’ll need to purchase a new one. I’m planning a trip for two to stay in Raja from 23 – 30 Juli. We were looking at both kayak4conservation and the resorts on Kri Island. I can’t seem to find out where to book the homestays connected to kayak4conservation. Is this part of stayrajaamapt or do I need to contact somebody else? Which homestays you’ll need to book will depend on the route you have planned. The K4C website has some maps than can help with that. I noticed in the comments that as of January, there had been nobody at tourist information in waisai at the port, and that they are moving to the Village. Has this move happened, or can PINs still be purchased at the port? When we were there in Feb 2015 the port office was open as usual. There are no plans to close it as far as we know. If the port office is closed permits can also be purchased in Waisai from the UPTD KKLD office as above. Do I need the entry permit to visit the Marine Park, OR I need the entry permit to simply go and stay on Raja Ampat? Does EVERYONE staying on Raja Ampat needs an entry permit? Yes Monika, you need the permit. How much costs the PIN when we have a KITAS? Meaning we are foreigners but we are living and paying our taxes in Indonesia? Nobody at tourist infirmation in waisai at the port. They say they come when the ferry comes, but not always. They are moving to the Village although the office is not finished yet. Good luck. Responsibility for collection of the permit fees is being transferred at the end of this month to a new collection body. It sounds like there’s going to be some confusion during the handover period! It was so convenient to be able to get them at the port too – hopefully that won’t change. we arrive in waisai on sunday the 1th of march, we fly in in the morning, at sorong, and trying to get the ferry at 14.00.
so if i understand it correctly we can get a permit after getting of the ferry, at the ferry terminal? If not it is also possible to get it on monday? Or do you really need one on the day you arrive? Hi Lianne – yes – when we were there last week the office described above was open when the ferry arrived. You could leave it to Monday, sure – but the office is usually only open at ferry arrival times. We have bought a permite on 20.03.2014. Is this permite valid for one year (expires on 19.03.15) or expires ther permite on 31.1.15 as printed on the permite? Hi Tobi – All existing permits will expire on the date printed on the permit. If I buy a permit tag at the end of January 2015. The price is 500.000. How long is this permit tag, which I bought this month, valid? I don’t know what the official view on that is, but I believe that if you purchased a permit in late January, it would be valid for your entire stay, even if your departure was after February 1. I’m also fairly certain though, that you would need to purchase one of the new 12 month ones if you were to return to Raja Ampat later. Some info regarding PIN’s reportedly being valid for 12 months. I arrived in Waisai on 24.11.14 and purchased a PIN at the Tourist Info Centre. The PIN has an expiry date of 31.01.15, and the receipt states “this entrance tag is valid for calender year (January-December)”. As I was expecting the PIN to be valid for 12 months, I asked for clarification of the expiry date and it was confirmed by the issuing staff member that the PIN expired on 31.01.15 and after that date a new PIN would need to be purchased. If this is true, it is absurd, because there is potential for a visitor being required to buy 2 PIN’s if the date of 31.01.15 is passed whilst in Raja Ampat. In my case, I would like to return later in 2015, so I would be required to purchase another PIN even if the original is only 10 months old. As an aside, 2 guys associated with this website were present when I enquired, and one of them (Australian…I think) suggested they were valid within a calendar year, not 12 months. Perhaps someone can obtain official clarification of a PIN validity period? It is indeed true (and absurd!) that PINs are valid for a calendar year, not from the date of purchase. Although this would indeed imply that being charged twice is possible, I doubt that would ever happen in practice. Keeping the receipts issued with the tag to prove date of purchase would be wise though. PIN fees will be doubled in 2015 and hopefully the validity period issue will be addressed as well. To clarify re: PIN- as of January 2015, the PIN system was transferred from the local government tourism authority (Dinas Pariwisata) to the local government organization charged with managing Raja Ampat’s five marine protected areas (UPTD BLUD under Dinas Keluatan dan Perikanan). This is to ensure that the money is more transparently going toward the operation of Raja Ampat’s marine protected areas as well as community conservation and development activities in the region. With the transfer of this system to the UPTD, the entry fee was raised to 1,000,000 for foreign visitors and 500,000 for Indonesian visitors VALID FOR A YEAR FROM DATE OF PURCHASE. The new entry fee cards (moving away from a PIN) will be issued beginning Feb 1, 2015. Plans to socialize the new system (to homestays, hotels, liveaboards, other operators) are currently being developed by some very hard working individuals. More communication will be made available as it is created. Great update Krista and thanks for posting it here – we’ve been wondering when the new scheme would be implemented! We’ll update the info on the page above and look forward to hearing of further developments as they happen. I have booked a liveaboard diving holiday in Raja Ampat. Does the boat normally arrange for the purchase or do I need to deal with it? You need to ask your liveaboard operator about that Chris. It’s our understanding that most include it in the cost. What happens if we arrive on a Saturday or a Sunday? Our homestay host will be picking us up: what happens if we don’t have a park permit? 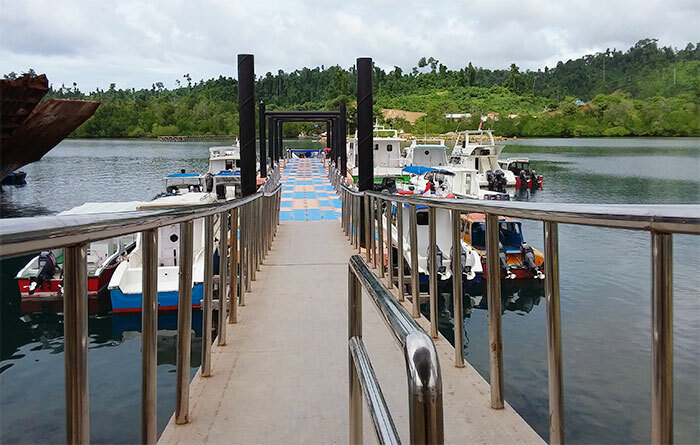 It’s been our experience that the office at Waisai – although closed the rest of the weekend – is open for permit sales when the ferry arrives on Saturdays and Sundays. There are men on the wharf asking if you have a PIN (permit) and directing you to the office shown above if you don’t. If you find that’s not the case on arrival, you should be able to organise for your hosts to pick one up for you. If park rangers find you without one fines usually apply. We’ve been in August and it was still 500.000 IDR. Thank you again. If the plane arrives at 13:15 and I have to make a crazy dash for the ferry, I guess I would have to buy the pass out on Waisai somewhere? If you are asking if it is possible to buy the permit in Waisai then yes – it is. See the information below “At the Waisai Tourist Information Centre” on the page above. Hi there, my dive operator is claiming a harbour fee apart from the permit. Any idea if this is true? Hi, I am heading to Raja Ampat and planning to obtain the permit in Sorong. Any updates if the price is Rp1000k or Rp500k ? Thanks ! Is it generally acceptable (and reliable) to obtain the Entrance Tags in Waisai rather than Sorong ? My plane arrival doesn’t allow much time to get from the airport to the Ferry. A stop at the Meridien Hotel might cause us to miss the boat. ? Definitely acceptable, but not 100% sure about the reliability of that Tom. (Only because we don’t know the operating hours of the Waisai office.) Anybody got further info about that? This is realy interesting as many of the liveaboards out there are charging in the hundreds of US$ for a park fee. Either the liveaboard boats you’re referring to have to pay extra charges to enter and moor in the park or they’re blatantly profiteering Jason. The approved fee is IDR 1,000,000 per international tourist for an entry permit valid for 12 months. The liveaboards should only charge you the face value of the PIN fee, which for now is still Rp.500,000 (but it will hopefully be increased to 1m in the next few months). Liveaboard operators are obliged to pay an extra annual fee for entering the Raja Ampat waters, but it is only Rp.10m for boats up to 10 guests, rising to Rp.30m for 17-24 guests. So a 10 berth boat doing one trip a month, fully loaded, will pay about USD 6 per guest over the year. This is peanuts, and I would be very surprised if any liveaboard operator tried to add this to the customer’s bill. If you find a liveaboard trying to charge you more than 500,000 for the PIN, or more than about USD 20 to cover their operating permit (let’s allow them some profit), then you should certainly question this, and post your experience here and on Trip Advisor etc. According to Anna and Mikhail’s comments below, you can still get RA Entrance Tags for IDR500,000 in Waisai. An official announcement of the increase to IDR1,000,000 for foreign visitors was made on July 1, 2012 and hasn’t been retracted as far as we know. Perhaps the Tourist Information Center at Waisai hasn’t been told? Or perhaps the tags being sold there aren’t legitimate? Has anybody purchased one at the Sorong Management Team office recently? It’d be nice to clear up the confusion! What about Kitas rates? Are there any? You could certainly try showing them your blue book but we’ve never heard of a discount for KITAS holders. As far as we know, it’s 250K for Indonesian citizens and a juta for everybody else. Are you sure the dive-tag costs 1.000.000 Rp now (double)? Can`t find that info anywhere else.. Yes – it’s true Nic. I’d realy like to know the organisation that sets the fee – I’m happy to contribute but feel that someone somewhere is milking this. There must be an official web page somewhere? Hi Jason. Have you seen the info linked by the “why and how” and “where the money goes” links in the article above? I’ll confirm and post more info for you, but my understanding is that the fee was set by the Raja Ampat regency government and community stakeholder groups in consultation with NGOs working on Raja Ampat conservation projects. There has been no “milking” to date. In fact, there’s a sizeable amount of cash in the community development fund awaiting agreement on its allocation. The official Raja Ampat government website (Bahasa Indonesia) is at http://rajaampatkab.go.id but it’s full of 404s and not much help.